Ever wondered why we live in a world of amazing smart technology, and yet many of the methods we use to run our homes are outdated and inefficient? Happily, that's no longer the case. With a Tado discount code you can enjoy great savings on an intelligent climate control system for your home. If you want to save money on heating your home with a clever gadget that senses when to switch on, a Tado coupon is perfect for you. Established in 2010 to find a smart heating solution for buildings that met the demands of individual residents, Tado is dedicated to promoting responsible attitudes towards energy consumption. Born out of a desire to allow people to live comfortably while still minimising the amount of energy they use, Tado aims to utilise modern technology to transform the way we heat our homes. With one third of the energy consumed around the world used for heating and cooling buildings, the company's smart approach has the potential to have a huge impact on conserving global resources. Designed in Munich and produced within the EU, Tado's smart thermostat works with your existing heating to create an intelligent climate control system. Compatible with 95% of heating installations including gas and oil boilers, heat pumps, electrical systems and more, Tado's hardware works in conjunction with your smart phone to deliver tailored and interactive heating for your home. The purpose of Tado is to use your phone's location to cut down on your heating bills. Through an app installed on your device, Tado monitors your distance from home and adjusts the temperature in your home accordingly. When all family members are leaving home, the smart thermostat reduces your heating; when you're approaching home, it raises it ensuring that you have a warm welcome when you arrive. The app also works to heat your home to the perfect temperature while you're asleep, monitors the weather to keep rooms at a comfortable level and learns more about your home as it works to provide the most effective heating solutions. It also lets you monitor how much you're saving – which could be as much as 31%. Tado also offers a selection of optional extras to help you design the perfect package for your home. From remote hot water control and monitoring to Tado care options to keep your heating ticking over, there's something to suit everyone. Want to get smart heating with Tado? With a Tado coupon you can get great deals on the next generation of heating solutions for you home. Whether you're looking to save money or take a step towards a more sustainable lifestyle, a Tado voucher will help you save money while you shop. Works with 95% of heating systems. 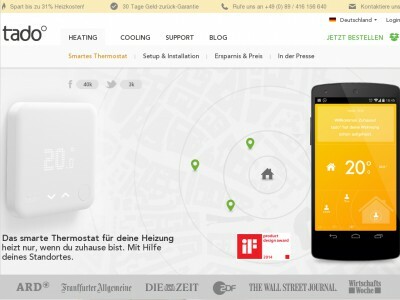 Browse our website until you find a Tado coupon that suits you, then navigate to their website to begin shopping. Click 'Order now' to order your smart thermostat. Select your current heating system and click 'Continue'. Select your current thermostat and click 'Continue'. Choose a finance option and click 'Order now'. Enter your Tado discount code in the box provided and click 'OK'. Want to find out more about the smart technology behind Tado? Why not check out the company's dedicated YouTube channel here? You'll find plenty of exciting content such as TV spots, behind the scenes videos and more. You can also use this channel to find out more about saving money with a Tado voucher code. If you've enjoyed shopping for smart thermostat at Tado, why not think about making more additions to your home with B&Q or Made.com? Or, if those aren't up your street, you'll find plenty more stores to browse in our Home and Garden section. Enter your Tado coupon in the box provided and click 'OK'. Fill in your contact details and click 'Continue'. Enter your billing and payment details to complete your order. If you need to return a product for any reason to Tado, you can do so by simply returning your items in their original packaging within 30 days of receipt. Need to contact the team at Tado? Whether you have a question about your order, want to know more about smart heating technology or simply want to find out how you could save money with a Tado discount code, you can contact the Customer Services department by filling in the online contact form here. Want to find out more about Tado? Why not follow the company across all your favourite social media platforms? You'll find lots of exclusive content including hints and tips on heating your home, industry news and more. You can also use these pages to find out more about saving money with a Tado voucher. Don’t forget to check them regularly, as you can never be sure when a free Tado coupon might be waiting for you! Buy now online at www.tado.com/. I always find it difficult to heat my home just right – I don't want to waste money heating it when I'm not there, but I don't want to come home to a cold house either. Tado offers a revolutionary approach to home heating – just visit tado.com to order your smart thermostat, available at a discount with a Tado voucher. I used the Tado discount code I found online to get a great deal on technology that uses my phone to heat my home to my requirements. Why not transform your household bills with a Tado coupon?